Ultrasound fat cavitation is the latest innovation on the field of low frequency ultrasonic treatments. 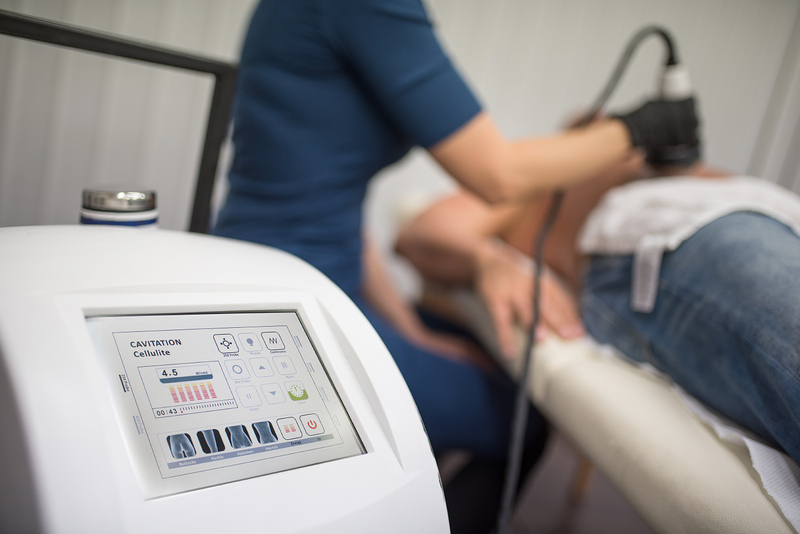 The ultrasonic cavitation machine produces ultrasound waves of special frequency and these create even, controlled and repeating microscopic vacuum bubbles in the space between the cells. This way it puts fat cells under great pressure and destroys them during the process of fat cavitation. This burst causes the fracture of weak, fragile membranes around fat cells thus it helps getting rid of unnecessary fat which is carried away from the body through the lymphatic system. The fat cavitation treatment improves the ability of the body to break down fat on the most problematic areas. The techniques stimulating lymph flow help to remove the materials created after the disruption of fat cells. Several researches show that 47 KHz is the most effective frequency because it can penetrate tissues intensively and it has cavitation effect in the required depths of adipose tissues. Fat cavitation is a completely safe and scientifically confirmed technology which can provide convincing and long-lasting results. Thanks to its properties, cavitation has selective effect, it is ruthless to fat cells under the skin but it does not damage surrounding tissues. Fat cavitation can affect problematic areas of the body (which do not react to slimming diet or physical exercise) with such intensity that was previously impossible with traditional treatments. Fat cavitation has no side effects. After the end of the cavitation treatment the client can carry on with the usual daily routine. There is no pain, no recovery time. Hány alkalom szükséges hogy látványos változást érjünk el? Egy kúra 6-10 alkalom. A kezeléseket heti rendszerességgel kell végezni. Általában a harmadik alkalommal már látványos az eredmény. A kezelés eredményességét elősegítheti a mozgás, szaunázás vagy nyirok masszázs alkalmazása. A bő folyadék bevitel ( 3l ) nagyon fontos. Mivel a kavitáció az ultrahang egy alacsony frekvencia tartománya, csak a zsír sejteket roncsolja, a környező szövetekben nem tesz kárt.